I have not seen an inscription or hieroglyph with the god Anubis in it. Is there a temple with his hieroglyph. The only thing that comes to mind is the weighing of the heart papyrus, which is not to my knowledge found in a temple inscription, or is it? Is the weighing of the heart only found on papyri? If someone could help me answer these questions that would be great. Is there a temple with his hieroglyph.
. What I meant was: Is there a temple with his hieroglyph? To add to the post I think I have seen statues of him at different temples, but always depicted as a complete dog, or jackal. 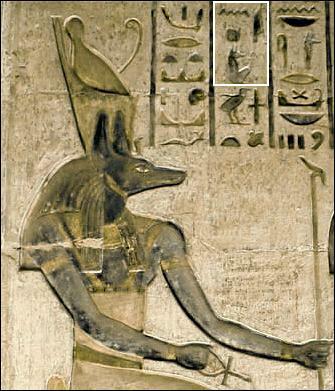 For Anubis as hieroglyph see the signs Gardiner E 15 & 16. Brigitte Altenmüller : Anubis. - In: Lexikon der Ägyptologie - Volume I. - 1975. - Col. 327 - 333. Richard H. Wilkinson : The Complete Gods and Goddesses of Ancient Egypt. - London : Thames & Hudson, 2003. - ISBN : 0500051208; 9780500051207. 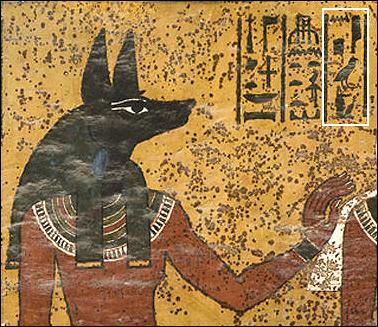 - 256 p.
I have not seen an inscription or hieroglyph with the god Anubis in it. Is there a temple with his hieroglyph. 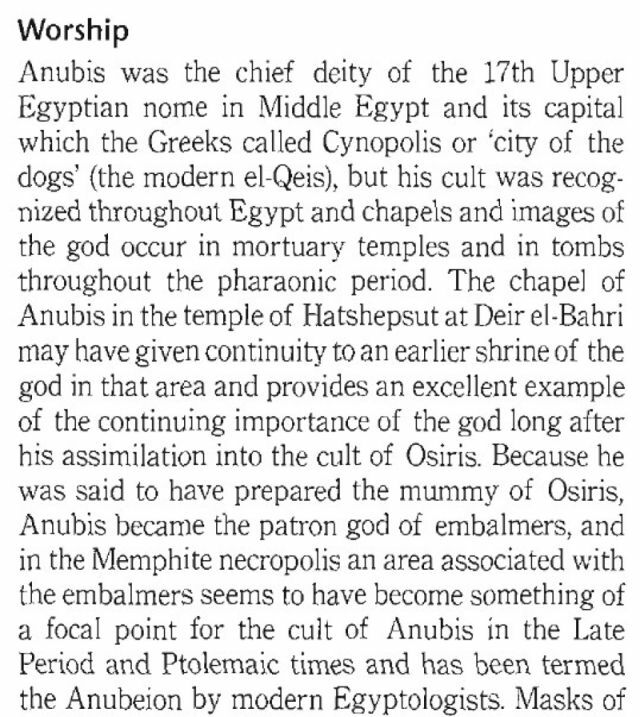 The question should be : Is there a temple or tomb without Anubis in it (at least since from the New Kingdom on...). @Aset : Could you pleace look at this ---> "Egyptian Dreams Forum Index -> Art and Literature -> Can Anyone Help Identify What This Says Please?" ? To date, archaeologists have not unearthed any monumental temple dedicated to this god. His “temples” are tombs and cemeteries. The major centers of his cult were located in Asyut (Lycopolis) and Hardai (Cynopolis). His name appears in the oldest known mastabas (mud-brick tombs) of the First Dynasty and several shrines to the god have been found. For example, a shrine and a cemetery of mummified dogs and jackals was discovered at Anubeion, a place located to the east of Saqqara. It seems that during the reign of the first dynasties he was even more significant than Osiris. 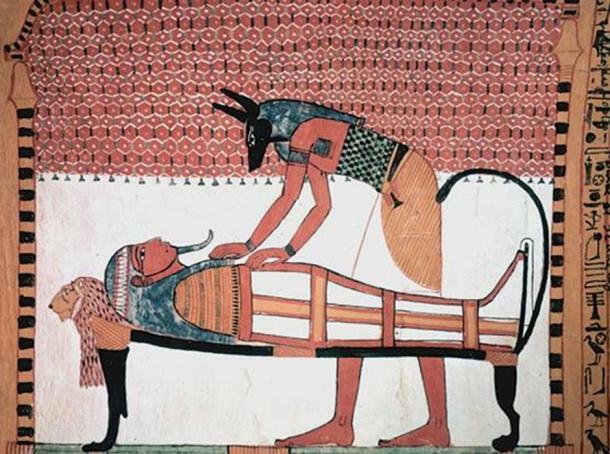 This changed during the Middle Kingdom period, but Anubis continued to be one of the most important deities.